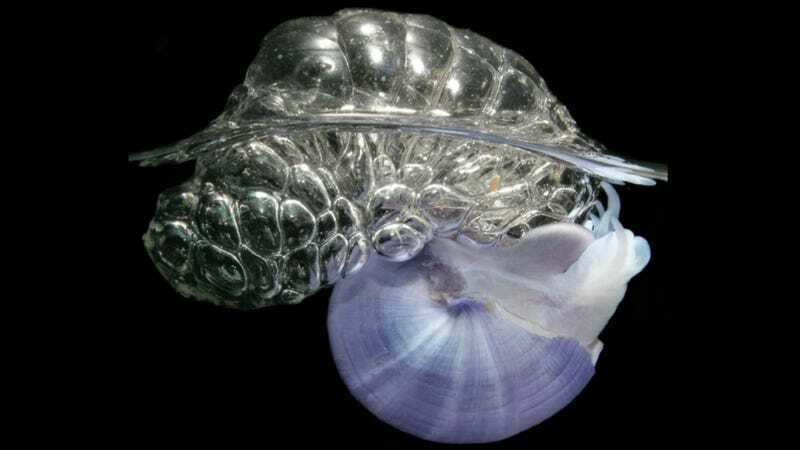 For years, scientists have marveled at the seafaring abilities of snails like Janthina janthina (pictured above), which produce a biological bubble-wrap that enables them to float just below the water's surface in oceans around the world. How some snails evolved to produce these sticky life rafts has long been a mystery. But now, a team of ecologists believes they've found the missing link that allowed snails to rise from the bottom of the sea to the top. According to Celia Churchill—first author on the paper describing the research team's findings—scientists have long known that these flotation devices were made from mucus that snails secrete from their feet. This mucus is folded over onto itself to trap tiny pockets of air and give rise to little snail-sized rafts. "If you're into mucus, it's a fascinating mucus," says Churchill. "It's almost like bubble wrap." According to the research team's paper, published in the latest issue of Current Biology, there were two basic hypotheses for how these self-generated flotation devices might have evolved. The first stated that the bubbles were simply a more sophisticated example of a technique known as "droguing," whereby young snails produce a thin thread of mucus that lets water currents transport them over large distances. The second stated that bubble-rafting techniques had evolved from the behaviors of a group snails called wentletraps, which are evolutionarily related to floating snails like J. janthina. Wentletraps live at the bottom of the sea, but when they reproduce, the female members of the species wrap their developing eggs in globs of sand and mucus that closely resemble the beginnings of a floating-snail's raft. In order to determine which hypothesis was correct, however, the researchers needed a specimen to bridge the developmental gaps. That specimen came in the form of a rare Australian floating snail belonging to the genus Recluzia, pictured here. "I started to dissect it, and when I pulled the float away, I noticed that there were tiny Recluzia on the float and egg capsules of the large female," said Churchill. Churchill's find suggests that Recluzia's egg-carrying/floatation technique evolved out of the the mucous egg masses of sea-floor snails like wentletraps. Moreover, it represents an evolutionary transition between ocean-floor snails and bubble-floaters like janthinids, many of whom no longer use the bubble rafts for purposes of reproduction.